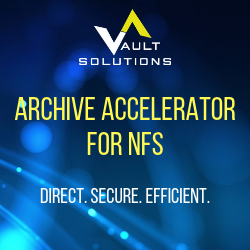 With Archive Accelerator for NFS, we’re introducing the ability to manage data on Network File System (NFS) storage, much like Enterprise Vault’s File System Archiving (FSA) manages data on Windows-based NTFS file systems. Archive Accelerator for NFS Archiving can be used to access data stored on NFS-accessible storage devices, then moving it to lower-cost storage connected to Enterprise Vault archiving servers. The archived data is optionally replaced by shortcuts, providing transparent access to data from any NFS client. There is no need for special software or drivers.